REGER Sonatas for Unaccompanied Violin, op. 42/1 and 2, op. 91/2 and 6. 3 Duos, op. 131b. Piano Trio, op. 2. 3 Suites for Solo Viola, op. 131d. Aria, op. 103a/3. Caprice & Kleine Romanze op. 79e. Albumblatt in EI, WoO II/13. Caprice in A, WoO II/10. Wiegenlied, op. 79d/1. Wenn die Linde blüht, op. 76/4.Mariä Wiegenlied, op. 76/52. Querstand is a Leipzig-based label, so it is little surprise that they have put out a Max Reger release for the centenary of his death in 2016, given the extensive performances and commemorative events that city organized to for its one-time celebrity resident. 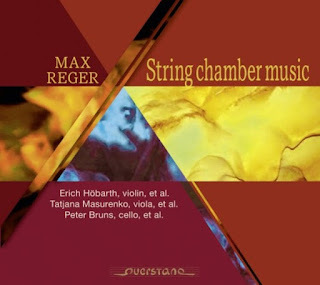 This collection is entitled String Chamber Music, and boxes together three previous, but recent, releases, Works for Violin, Works for Viola, and Works for Cello. The project came about as a result of a focus on Reger at Leipzig’s Mendelssohn Hochschule, where 25 string students were given the opportunity to study the composer’s music with the violinist Erich Höbarth, violist Tatjana Masurenko, and cellist Peter Bruns. This culminated in a series of recording sessions in the Hochschule’s Grosser Saal in November and December 2015, hence the huge number of contributing artists to these three discs. Given that background, the most surprising aspect of this release is its consistency, in both audio quality and the standard and style of the performances. Unaccompanied works make up the bulk of the violin and viola discs, the opp. 42 and 91 Sonatas and the op. 131d Suites respectively, and none of the student performers are found wanting for the high degree of exposure. Technically, there are a few, very minor issues with consistency of articulation and security of pitch, but nothing to challenge the utterly professional standard throughout. Even picking out the teachers from the students is a tricky task. And perhaps it is the influence of these teachers that lends the recordings such consistency. The style of performance on the violin and viola discs is disciplined, with few Romantic indulgences of articulation and rubato. The cello performances are a little broader, slower and more flexible, but not to a fault. That said, the sheer discipline of these performances is what prevents them from competing with the very best. Most of this music is now well represented on disc, with numerous performers demonstrating how individuality can be projected, even through the strictest of Reger’s neo-Baroque textures: I’m thinking of Ulf Wallin in the solo violin music, Tabea Zimmermann in the viola works, and Alban Gerhardt with the cello music. Obviously, it is a tough call to expect conservatory students to compete with their like, but the overall impression here is that individuality has been constrained for the sake of consistency. If so, it has succeeded, but at what cost? Otherwise, my major objection is the brazen randomness of the programming. The op. 131d Viola Suites is the only such collection of works presented here in its entirety. The other two collections jump around Reger’s prolific output, making orientation very difficult. The viola disc opens with the op. 2 Piano Trio, hardly a “work for viola” and also, as juvenilia, a poor substitute for the far more distinctive and accomplished op. 102 Piano Trio. Also, as a sampler of Reger’s chamber music, the focus on unaccompanied works places too much emphasis on his neo-Baroque style, and we hear very little his high Romantic music, which makes up more of his chamber music and which is, again, more distinctive. The cello disc is the exception here, offering an accomplished rendition of the op. 116 Cello Sonata from Peter and Annegret Bruns, the highlight of this collection. That sonata was dedicated to the cellist Julius Klengel, another name closely associated with Leipzig, so the cellists have taken the opportunity to include two of his own works (not that Reger’s own cello catalog is remotely exhausted). Klengel’s style is mainstream, post-Brahms Romanticism, and the three works, a Suite for three cellos, a scherzo for cello and piano, and Hymnus for 12 cellos, are proficient and elegant. The harmonic style may not actually be as conservative or as relentlessly consonant as it sounds here, but that is what comes of being programmed with Reger. This is a collection of satisfying recordings by excellent young musicians, but the bizarre programming makes it difficult to identify an audience. It’s not comprehensive enough for collectors, nor representative enough for those wishing to sample Reger’s chamber music. The discs are available separately, so Works for Cello gets a nod, for the excellent op. 116 Cello Sonata and for the Klengel rarities.